Town chairman David Bosomworth said the appointment of Billy Heath was made with the long-term future of the club in mind. Heath was unveiled as Halifax’s new manager this week in place of FA Trophy winning boss Jim Harvey. Harvey’s departure was announced just two days after he guided Halifax to victory at Wembley against Grimsby. 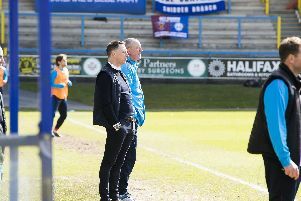 Bosomworth did not want to comment on why Harvey’s contract had not been renewed, but believes in Heath, he has appointed someone with a proven track record in the Conference North. “We would like to thank Jim and Tommy (Miller, former assistant manager) for all their efforts and wish them both every success in the future. “They did their best to alleviate the position we were in. “It’s a sad decision to make because Jim wanted the job, but we have done what we think is best for the long-term future of the club. “We have thought about the situation going forward over the next two, three, four years with this appointment. “Billy and Mark (Carroll, assistant manager) know this league and understand what it takes to get out of it. “They’ve achieved two promotions at North Ferriby and two top-five finishes. Read more from the Town chairman in this week’s Halifax Courier on Friday.